I got up this morning, made a cup of hot, black tea and turned to my computer. I distracted myself for a while by reading blog posts and scanning the news. But atlas, I couldn’t avoid my real chore of the morning any longer. I heated up another cup of tea and started paying bills. As much as we try to live off of the grid, we will never be completely disconnected – at least not until the kids are out of the house and I’ve retired. Even then, we’d probably have one or two tethers to society. In the meantime, my line of work requires too much connectivity to be 100% off of the grid. We keep striving, though. And bill time only serves to re-enforce our goal. After the bills were paid, I made breakfast for my family. My two daughters helped. We made french toast, scrambled eggs, and toast from Laura’s homemade honey wheat bread. That made up for the sour taste that paying bills had left on my virtual palate. After breakfast, Laura geared up for her first-of-the-month shopping trip. Within the first few days of each month, Laura goes and buys the majority of the food items we’ll need for the month. With a family our size, that makes for an extended trip. But it also means that for the rest of the month, she only has to make quick, easy runs to replenish perishable items like milk, juice, etc. We don’t milk dairy animals. That’s more of a commitment that we’re willing to make at the moment. But, we are preparing to buy two milk goats soon. We won’t necessarily begin milking them immediately, but it’s good insurance to own them just in case. In fact, that’s how I spent the next part of the day: fencing an heretofore unfenced part of the pasture. The cows need the extra grass and the goats will like to this new area as well. A while back, a friend of mine gave me a several old power line poles; they were on his property when he bought the land and he had no need of them. I’m cutting them into smaller pieces to use as corner posts on the fence line. I used the auger on the back on the tractor to dig a hole for the posts. Before I knew it, Zeus fell in the hole! 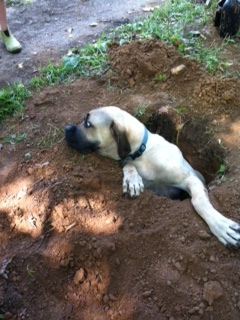 Imagine trying to get a 150-plus pound dog out of a 3 1/2 foot deep hole when it’s only 12 inches across. It wasn’t easy. We tugged and eventually freed the little Einstein. Afterward we watched Courageous. Powerful movie for parents, especially fathers. The first time Laura and I saw it, she commented “That’s the best movie I never want to see again.” We watched it with the kids this time, though Laura was in and out of the room doing other things. I got a lump in my throat…again. Joe thanks for the grizzly reminder. i have to pay the bills as well. I lived off the grid for about 10 years but like you said it wasn’t totally off the grid. I was able to get telephone and internet and like you said they were a necessity for work. If you can get the goats while they are still producing milk try the milking thing for a bit before you let them dry up. 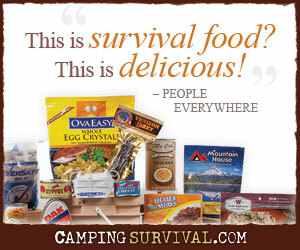 For taste and for the experience for the kids so they know what to do when they have to. Goats are very good at getting out so make a good fence. We’ve tried goat milk before, George. I like it, though it’s different than the pasteurized cow’s milk you’d buy at the store. Good point, Practical. A friend of ours has successfully managed to milk their dairy cow once per day by allowing the calf to nurse the other half of the day. We may try that with our goats at some point.